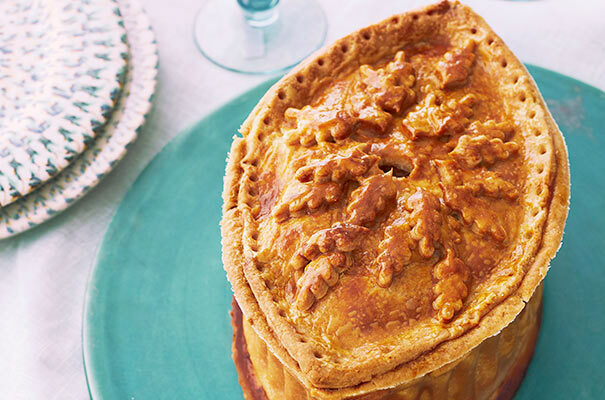 Raised pies have been a favourite of the British table for centuries, at one time majestic, elaborate constructions decorated with pastry columns, crests and coats of arms. This is a slightly more restrained version, but it is still a great-looking centrepiece for an autumnal party. A mixture of venison, rabbit, pheasant, pigeon or wild boar (according to what game you like, and what is available) is encased in crisp and rich, hot-water-crust pastry, which traps all the savoury meat juices without becoming soggy. 1. Start by making the filling so the flavours have time to develop. Put all the ingredients into a large bowl. Add a little salt and pepper, then mix everything together with your hands until thoroughly combined. Take a teaspoon of the mixture, shape it into a small ‘burger’ and fry it for a minute or so on each side until cooked through, then taste and add more seasoning to the filling mixture, if necessary. Cover and chill while you make the pastry. 2. Heat the oven to 200°C/400°F/gas 6. Combine both flours and a pinch of salt in a mixing bowl. Add the butter and rub in* lightly using your fingertips. Pour the water into a small pan and add the salt and lard. Heat gently until the lard has melted, then bring to the boil. Pour the hot mixture on to the flour and quickly mix everything together with a wooden spoon to make a dough. As soon as the dough is cool enough to handle, tip it out on to a floured worktop and knead it just until smooth and even. 3. This pastry becomes crumbly as it cools, so you need to work quickly now. Cut off a third of the pastry and wrap it tightly in clingfilm. Roll out the remaining pastry to an oval or disc large enough to line your tin. Carefully lift the pastry into the tin and press it on to the base and side, smoothing out wrinkles. Leave excess pastry hanging over the rim. Check there are no cracks or holes in the pastry case – press the pastry together or patch with small scraps of pastry. 4. Roll out the remaining pastry to an oval or disc, slightly larger than the top of your tin, to form the lid. Cover with clingfilm and leave on the worktop for now. 5. Spoon the filling into the pastry-lined tin and press it down well, making sure the surface is level. Brush the edge of the pastry case with beaten egg yolk, then lay the pastry lid on top. Press the edges of the case and lid together firmly to seal. Trim off the excess pastry and crimp or flute* the edge neatly. Make a hole in the centre of the lid to allow steam to escape during baking. 6. Gather up the pastry trimmings and roll them out again. Stamp out 20 leaves with the shaped cutter. Attach these to the pastry lid, using a dab of beaten egg yolk as glue. Brush the lid all over with beaten egg yolk to glaze. 7. Set the tin on the baking sheet and bake in the heated oven for 30 minutes. Turn down the oven temperature to 170°C/325°F/gas 3 and bake the pie for a further 1¾ hours until the pastry is a rich golden brown. 8. Leave the pie in its tin until completely cold before unmoulding. Serve at room temperature, on a rimmed plate to catch any juices. Store any leftovers, tightly wrapped, in the fridge.